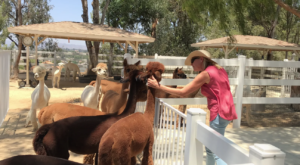 If you love the charming small towns of Southern California, you’ll definitely enjoy exploring this lovely spot on the map in SoCal that is a treasure trove of enjoyment for the whole family. 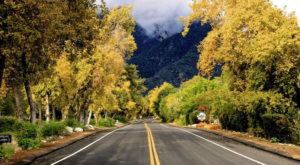 Beautiful scenery, tasty homemade pies, quaint local shops, and crisp mountain air are just a few of the things you will find in this delightful and picturesque SoCal destination. 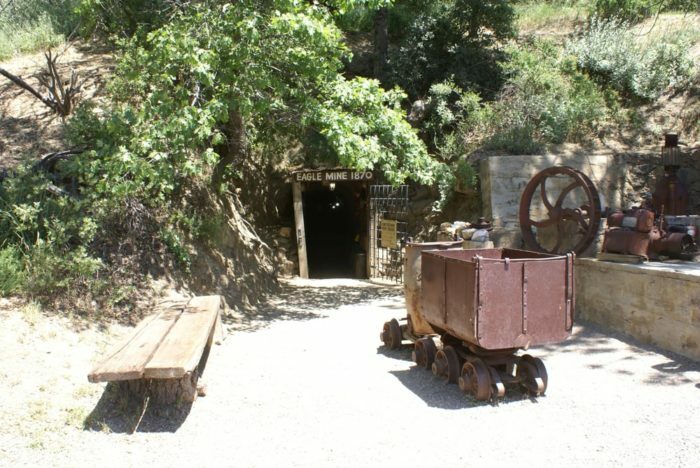 Located in San Diego County, Julian is an historic gold mining town about an hour outside of San Diego. 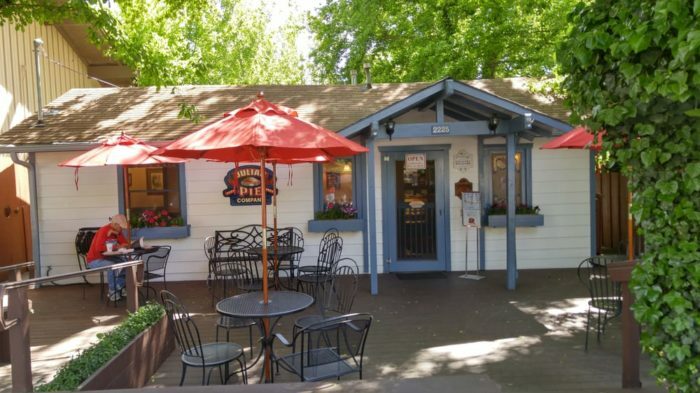 Known for its peaceful surroundings, scrumptious apple pies, stunning apple orchards, and charming local shops, this is one tiny town that sure knows how to capture the charm of the good ol' days. 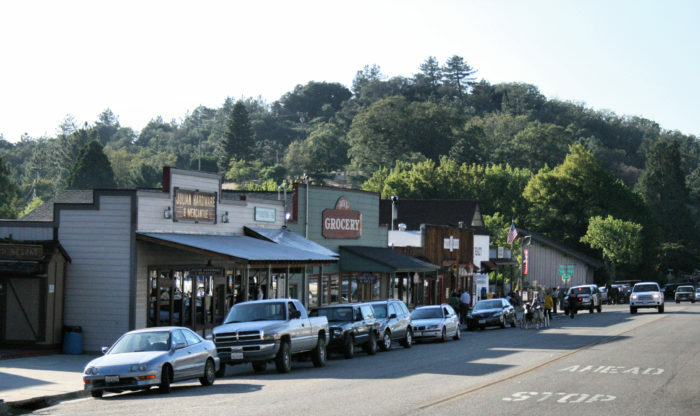 It's no joke when we say Julian is a small town. 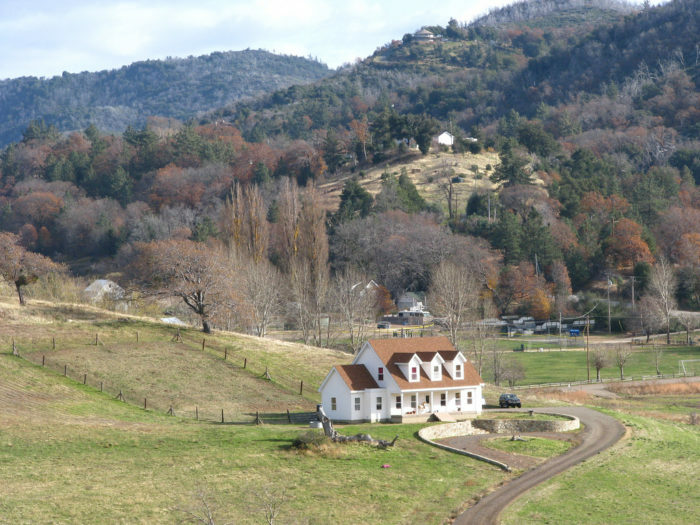 As of the last census, Julian's population was barely over 1,500 residents. 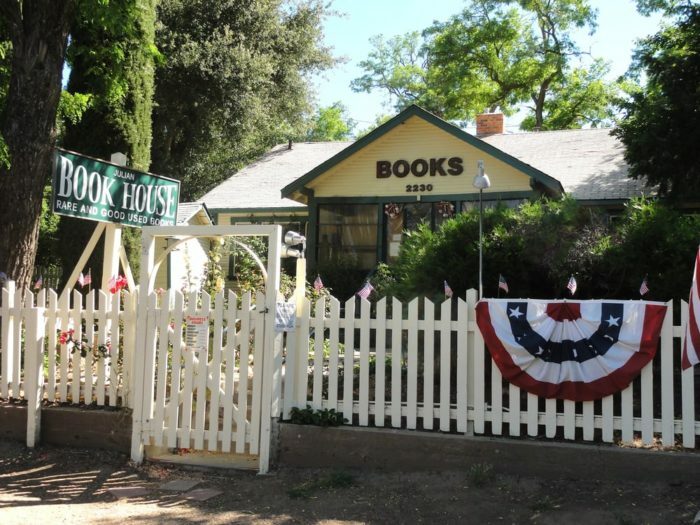 If you enjoy learning about the history of this small SoCal town, you can start by heading to the Pioneer Museum at 2811 Washington Street. 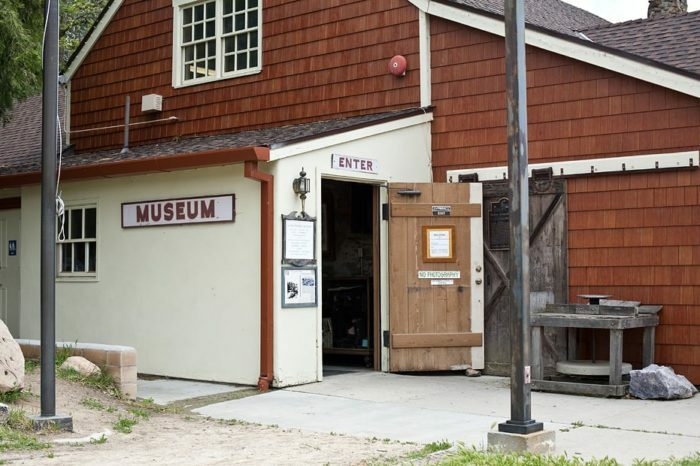 Located in a former blacksmith shop, this museum will take you back in time as you learn about Julian's history dating as far back as as 1869. 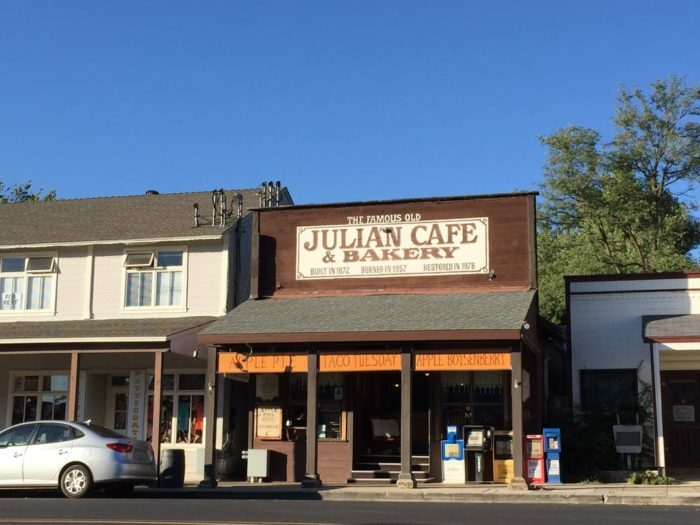 Being that Julian is an old gold mining town, it only makes sense that you would pan for gold while visiting this historic SoCal town. 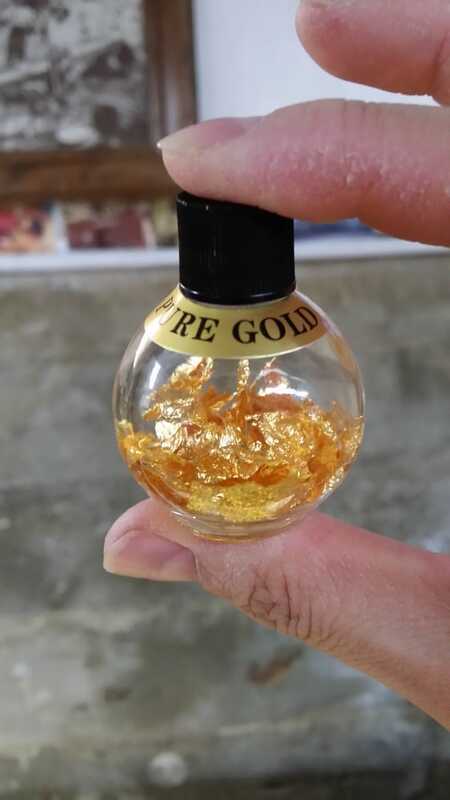 The Eagle Mining Company offers guided tours through their gold mines so you can see what a typical day in the life of a miner was like back in the 1800s. Browsing around this charming local book store located right on Main Street is always a treat. 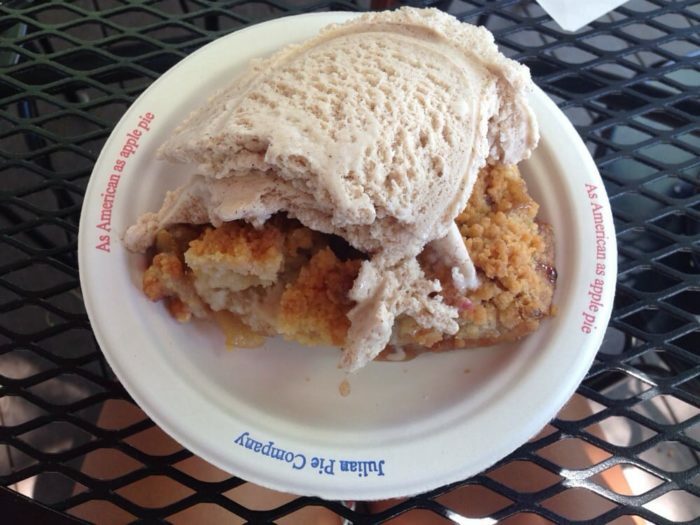 A visit to Julian without stopping for apple pie would be a crime. 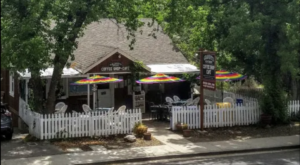 The Julian Pie Company is a favorite of mine. You can find them at 2225 Main Street. Order a slice or splurge a bit and take home a whole pie. 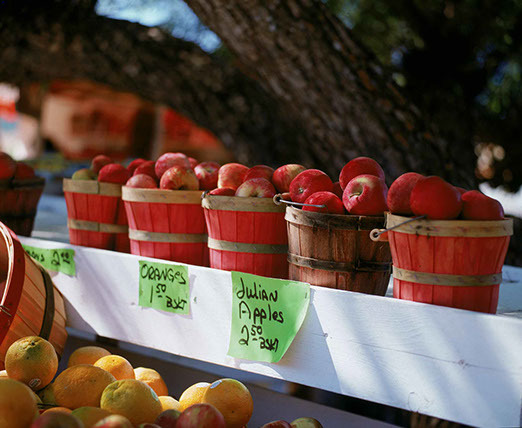 If you love apple pie, then you're going to love visiting the many apple orchards sprinkled throughout the area. 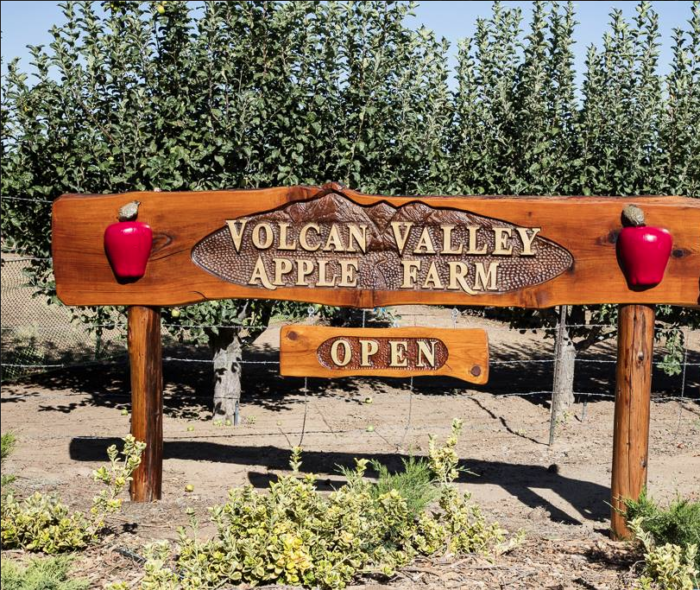 Volcan Valley Apple Farm is one of our favorites: 1284 Julian Orchards Drive. Oops! Looks like we forgot about lunch. 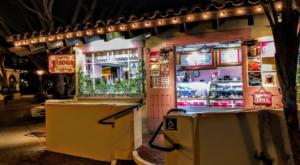 Now that we've had dessert first, it's time to head to Julian Cafe for a homecooked meal that will make your mouth water. 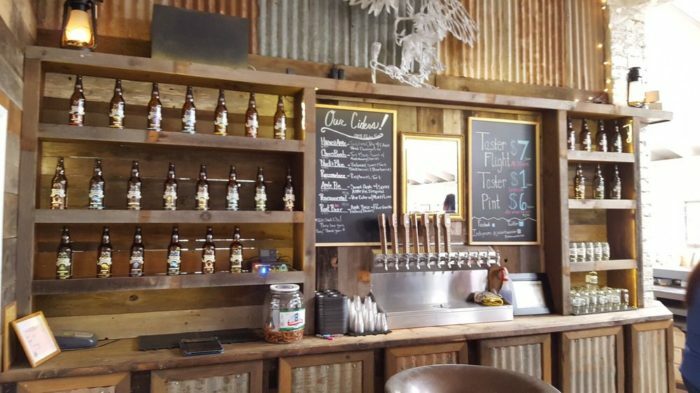 Just step inside the saloon and take your pick. 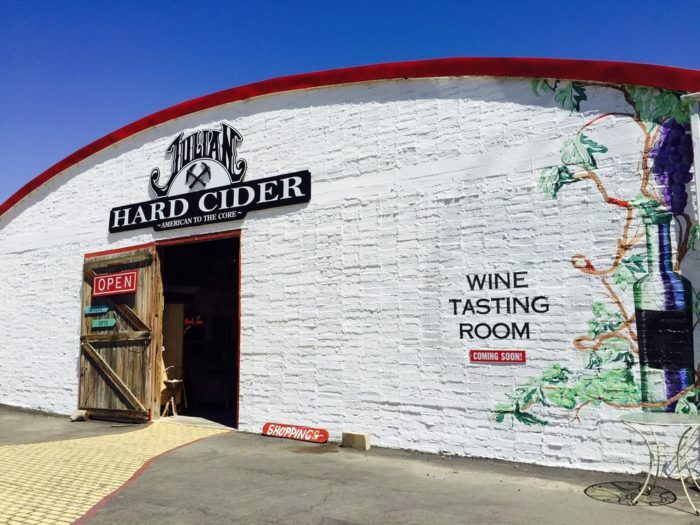 What a great setting for a tasting room. 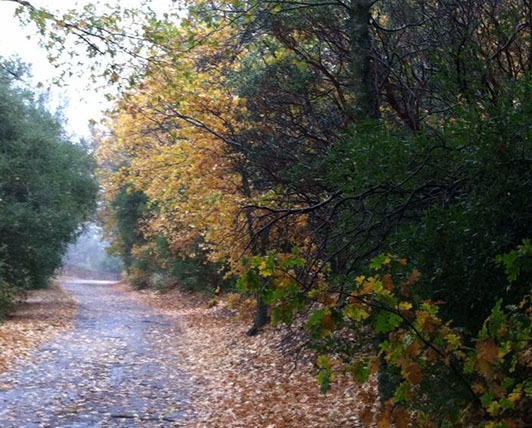 After all that eating and drinking it's time to get out in the woods and breathe that fresh Julian air. Take a walk through this town and you'll find peaceful stretches of land that will surround you with trees and falling leaves. Or how about a carriage ride? 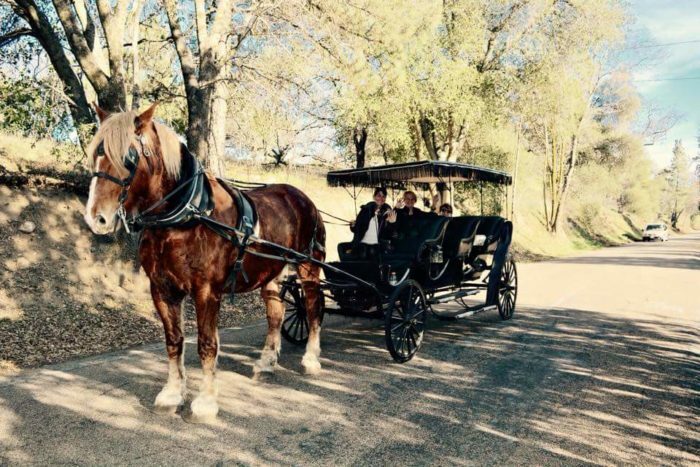 If you're too tired to explore on foot, take a relaxing carriage ride through the quiet streets of this tiny town with Julian Carriage Company. 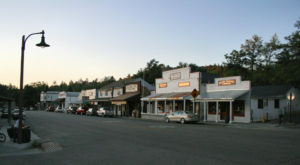 They are located along Main and Washington Street. 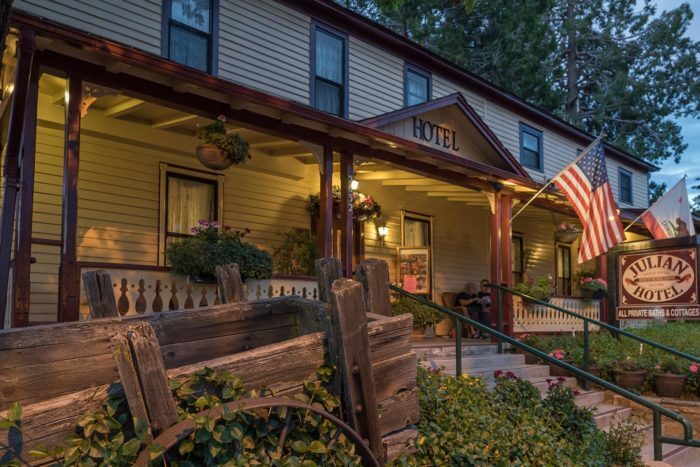 If you decide to extend your day trip to an overnighter, you'll find a variety of lodging to choose from in Julian. 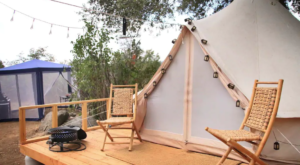 From hundreds of cozy cabins for rent by individual owners to intimate Bed and Breakfasts and even traditional hotels, there's a little something for everyone no matter what your budget. I’m ready to head to Julian! So much to do and so little time. Where will you start? 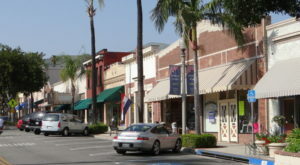 If you want to check out more charming small towns in Southern California, we have a few more spots you might enjoy right over here. 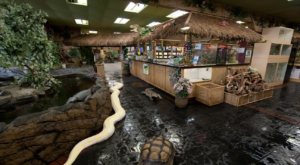 Have fun exploring SoCal!